The Builders Club is a junior high service organization sponsored by our local Kiwanis Club. Its purpose is to develop competent, capable, caring leaders through the vehicle of service. The club has raised funds for Miles for Miracles, Kids Against Hunger Coalition and Trick or Treat for UNICEF where they help eradicate Maternal Neonatal Tetanus from the world. Members have volunteered at the Soup and Sandwich Supper, painted trash cans at the school, and made and delivered Valentines and sang Christmas carols to the residents of assisted living homes. Students in grades 9-12 are eligible to participate in this civic-based program. It gives students an opportunity to increase their civic involvement and encourage civic awareness. Close Up travels every other year. 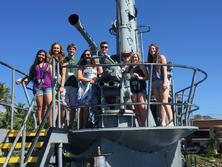 Students typically hold fundraisers to help offset the cost of the trip. In the past, Christmas wreaths have been sold and a garage sale has been held. The Destination Imagination program encourages teams of learners to have fun, take risks, focus and frame challenges while incorporating STEM (science, technology, engineering, and mathematics), the arts and service learning. Our participants learn patience, flexibility, persistence, ethics, respect for others and their ideas, and the collaborative problem solving process. Teams may showcase their solutions at a regional tournament. Students in grades 7-12 may participate. Students in grades 9-12 are eligible to participate in Drama Club. Usually, one performance is scheduled each school year. The students have an opportunity to get involved at every level, from designing the set, to promoting the production, to filling a role. All of this is done outside of class time. Forensics offers students an opportunity to compete in a variety of categories. Forensics explores individual speech events building on voice and diction. Students in grades 9-12 may participate. The Language Arts team participates in the MSAC academic team league. They have three meets a year. Each school sends 12 members to the event where they are given two hours to use their teamwork skills, writing skills and creativity to produce their quality writing. These may include a position paper, a fictionalized journal, etc. Each team may submit at least two, but no more than four entries, which are then judged and scored by league coaches. Students in grades 9-12 are eligible to participate. Model UN is a competitive simulation of a session of the United Nations General Assembly. Teams are required to research a variety of political, economic and diplomatic issues as part of drafting resolutions to be introduced into the general session. They are scored in 5 categories during the UN session held at the Gratiot/Isabella RESD in Ithaca. The categories are: Parliamentary Procedure, Being in Character to the Delegation, Effective Problem Solving, Knowledge of the Session Topic and Knowledge of the UN. The MSAC usually holds three meets per year. Students in grades 9-12 may participate. Sacred Heart Academy’s National Honor Society chapter, Cor Jesu, is a group of juniors and seniors who exemplify outstanding scholarship, character, service, and leadership. The purpose of the National Honor Society is to create enthusiasm for scholarship, stimulate a desire to render service, promote leadership, and develop character in the students of Sacred Heart Academy. NHS is a student-run organization, under the supervision of a faculty advisor. 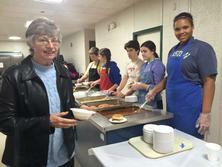 Each year, NHS students participate in a minimum of six service projects each. Past projects include: organizing a charity 5K, running the Homecoming Parade, raking leaves for the elderly, leading school fundraisers, and many more to contribute to the SHA and Mount Pleasant communities. Click here for Membership Selection Process. A team competition with a format similar to Jeopardy. It is a game of questions and answers based on a variety of subjects including sports, science, history, math and literature. 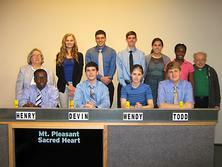 Sacred Heart has been participating in Quiz Bowl since the academic league started in 2003. Our team usually does very well in our league. Quiz Central started in 2005 and we have been participating every year. In 2015 and 2016 the quiz bowl team made it to Nationals in Chicago. Similar to regular Quiz Bowl, but students will compete during Catholic School’s Week to answer religion based questions. Students in grades 9-12 may participate. Every fall the juniors and seniors attend a daylong retreat held at an off-site location. It is normally held on a Friday in early November. Students leave campus by 8 a.m. and return about midnight. The theme varies each year and generally relates to relationships with God, family and friends. In addition, seniors have a day long retreat the week of graduation. It is usually held at CMU's Neithercut Woods. It is our intent to offer a retreat for each grade in the secondary building. Students in grades 6-12 are eligible to participate. Students have the choice of competing in several different events. They work on their projects leading up to the competition and then compete against other teams. In the past, events have been held to build a trebuchet (catapult), or compete in more knowledge-type events such as the identification of trees. Consist of two representatives from each grade 9-12. Students run and are elected by their peers each spring for a one year assignment. Student senate organizes different events throughout the school year including homecoming activities, Student for Student events, special fundraisers or collections to assist the needy, and several other activities. Students in grades 9-12 may participate. Students in the fine arts have an opportunity to showcase their talents by participating in try outs for the traveling MSAC talent show. Two acts are selected from each school and they join with the acts from the other conference schools to perform a talent show at each school within the conference. This is typically held in late spring and students in grade 9-12 may participate. Competition includes teams from Coleman, Ashley and Vestaburg. All high school students are eligible to participate in the day long competition in desktop publishing, spreadsheet, database management, multimedia and web page contests.